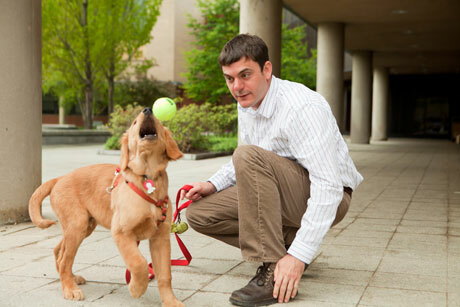 Adam Boyko, assistant professor of biomedical sciences in the College of Veterinary Medicine, plays with a dog. From ancient alchemical quests to modern biological research, efforts to understand and combat human aging have borne few fruits. Now Cornell scientists aim to bridge the gap between lab research and aging’s complexities in real life using the power of dogs. With funding from the National Institutes of Health’s National Institute of Aging, they are joining interdisciplinary collaborators from across the country to form the Canine Longevity Consortium – the first research network to study canine aging. It will lay the groundwork for a nationwide Canine Longitudinal Aging Study (CLAS), using dogs as a powerful new model system that researchers can study to find how genetic and environmental factors influence aging and what interventions might mitigate age-related diseases. Until now, researchers have studied aging mostly in short-lived, inbred, lab-based animal models like yeast, worms, flies and mice. Yet a large gap divides these models from humans and other genetically variable populations living in complex environments. For a model system to bridge that gap, its constituents would need to have more genetic variability than lab clones, live in environments similar to humans and age in patterns long enough to closely study individuals’ entire lifetimes. Boyko and his colleagues aim to craft the CLAS to see how an individual dog’s aging trajectory is shaped by genes and the environment, gain detailed understanding of when and why dogs die, and find treatments to combat age-related illness. The consortium will also develop training opportunities in aging research for junior scientists, veterinarians and the general public. The researchers will start with pilot projects to choose the best breeds for the study and to determine how best to collect, analyze and share the large-scale data it will produce. The team will conduct an epidemiological analysis of genetic and environmental factors influencing canine lifespan, high-resolution mapping of canine longevity, and a yearlong epidemiological analysis of age and cause of death in all dogs seen within a select group of three private veterinary clinics. Though past longitudinal studies in humans have lent insight to aging research, Boyko says a longitudinal study in dogs has the potential to test a range of critical ideas at a rapid pace not possible with humans.